Let's all do our part to help save the Earth!! There is no Planet B!! For this A2 card I started with White card stock. 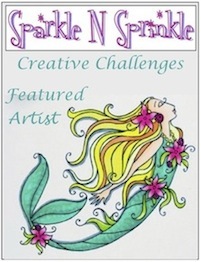 I took a piece of Neenah Solar White paper, the distress inks and my craft mat. I rubbed the different color inks onto the mat and then spritzed it with water and smooshed my paper through the ink and let it dry. When it was dry I spritzed a little more water onto the paper and let it dry. 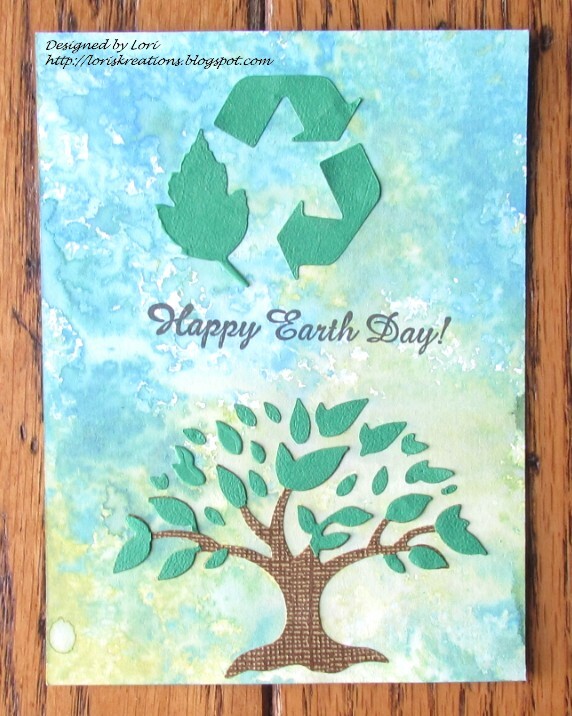 I took the brown and green paper and cut out the tree and leaves with the Reuse die set and arranged the tree and the recycle symbol onto the card. I took the Rubberhedgehog Happy Earth Day stamp and some black ink and stamped the sentiment onto the center of the card. Remember to think GREEN today and everyday!! I hope the Easter Bunny brought everyone some nice treats today! For this A2 card I started with White card stock for the base of the card. I took a piece of two tone paper, inked the edges with Tumbled Glass distress ink and added it to the base of the card. I took the Impression Obsession Wheelbarrow die and some brown paper and cut out the wheelbarrow. I took the Impression Obsession Mini Bunnies die and some tan paper and cut out the bunnies. I took some green paper and cut the Impression Obsession Smaill Grass Border die a couple of times. 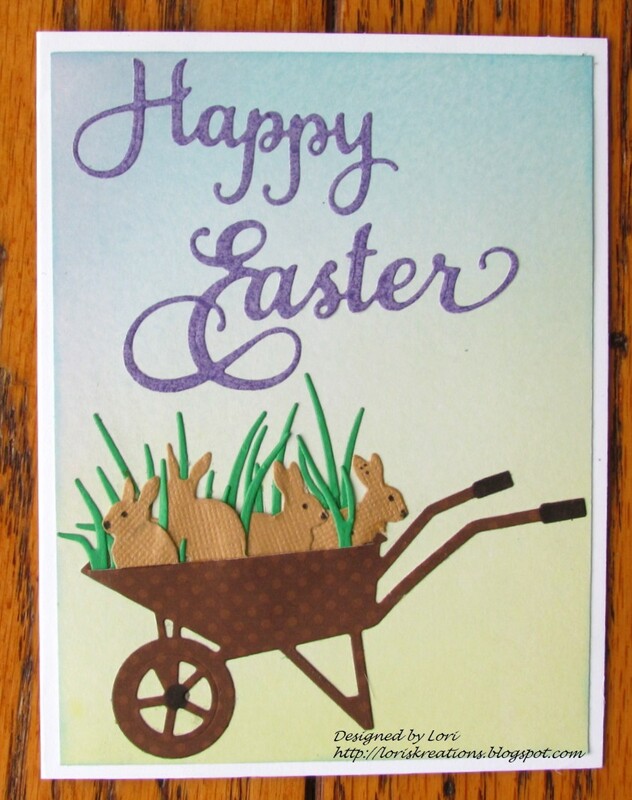 I added the grass and the bunnies to the wheelbarrow and then I added the bunny filled wheelbarrow to the card. I took a black marker and gave the bunnies eyes and noses and I colored the handles on the wheelbarrow. I took the Impression Obsession Happy Easter die and some purple paper and cut out Happy Easter and added that to the card. 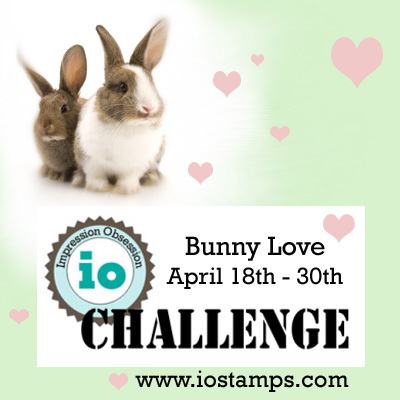 I am entering this card into the Impression Obsession Bunny Love Challenge. Today I am sharing a card that I made for the Die Cutting Divas Challenge #416 ~ Animal Abuse Awarness. For this A2 card I started with White card stock for the base of the card. I took a piece of Neenah Solar White paper and the Tattered Lace Holly Husky die and cut it out. I colored her with Copic markers in the Warm Grays. I took a blue maker to color in the eye and attached it to the card. I took some Black paper and the Impression Obsession Checkered Frames die and cut out the frame and placed that onto the card. I took some black ink and a sentiment from the Whimsy Stamps Adopt Don't Shop Dogs stamp set and stamped it under the husky. 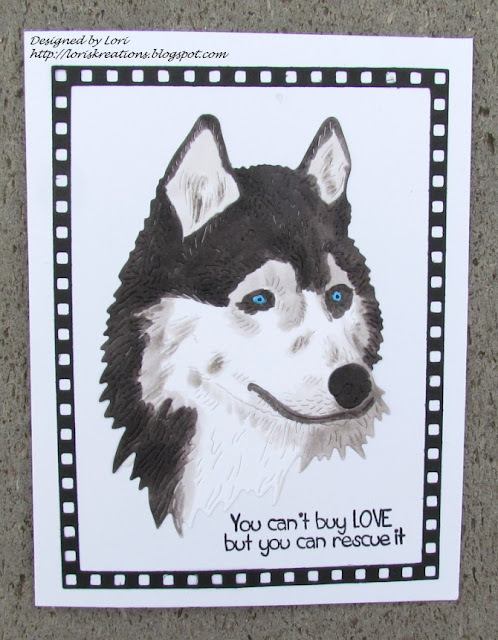 I love this die so much because I have two rescued huskies that live with me! 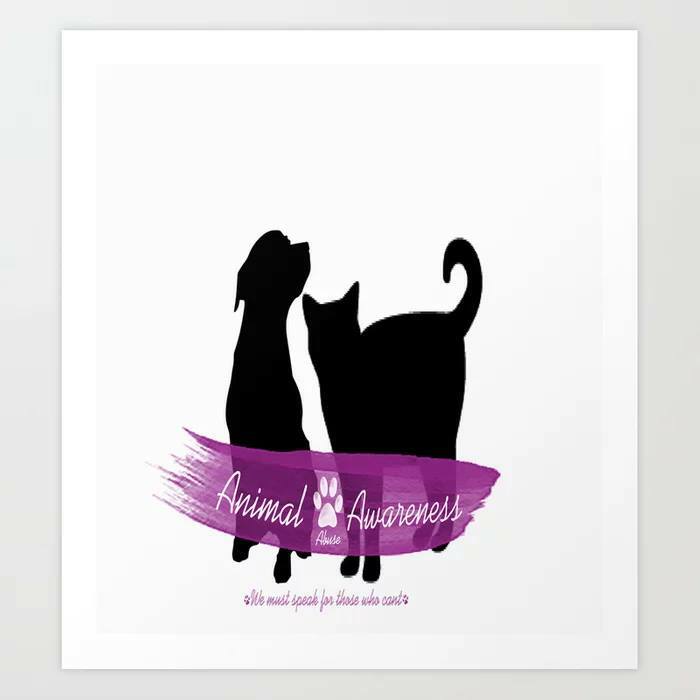 Please be sure to stop by the Die Cutting Divas Challenge #416 ~ Animal Abuse Awareness to see all the wonderful Animal Creations!! 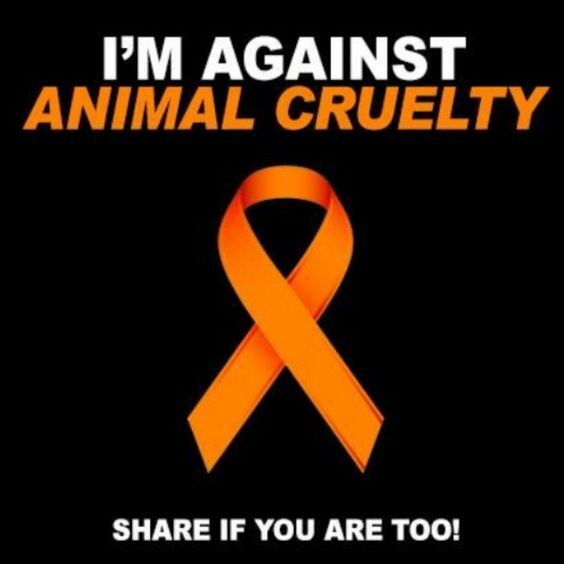 I am against Animal Abuse and I hope that you are too!! Today I am sharing a Black & White only card. For this A2 card I started with White card stock for the base of the card. 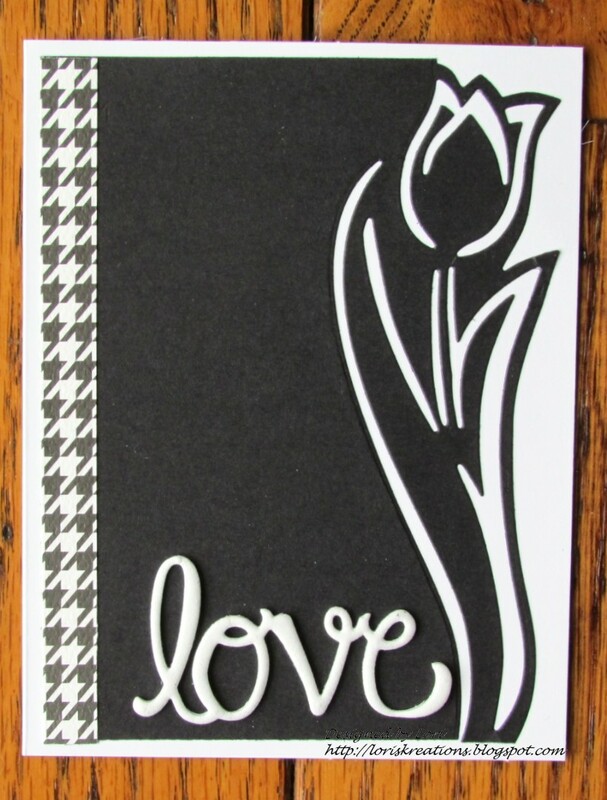 I took a piece of 4 inch by 5 1/4 inch Black paper and the Technique Tuesday Tulip on the Border die and I cut out the Tulip on the right hand edge of the paper and then added that to the card base. I took some White fun foam and the Die-Versions Curly Words Love die and cut that out and then I added the word to the bottom of the card. I took a piece of Black & White paper and cut that into a strip and placed that on the edge of the Black paper. Be sure to stop by the Double "D" Challenge to see all the wonderful Black & White Creations! For this A2 card I started with Neenah Desert Storm paper. I took a piece of garden paper, inked the edges with Brown ink and then added that to the card. 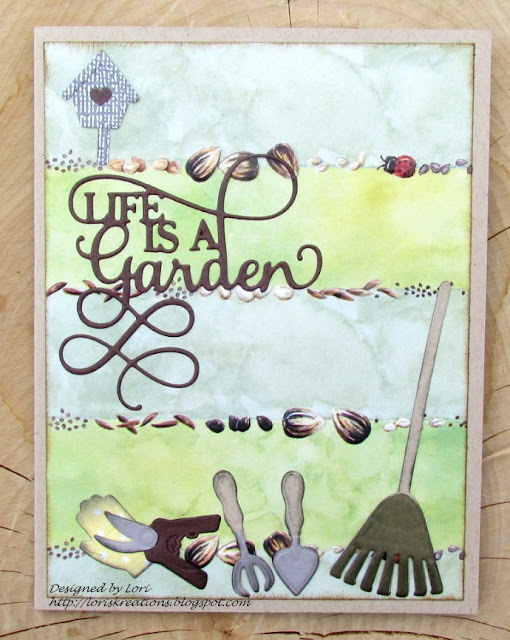 I then took some Brown paper and the sentiment from the Sue Wilson Designs Life is a Garden dies set and cut that out and added that to the card. I took some scraps of paper and the gloves, rake and tools form the same die set and cut them out, inked the edges with black ink and added them to the card. I took some Gray Coredination paper and the Frantic Stamper Garden Birdhouse die set and cut out the birdhouse and added that to the card. I took a scrap of brown paper and cut out the birdhouse again so that I could fill in the heart opening with it. 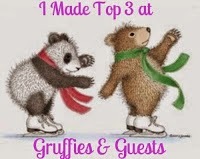 Be sure to hop on over to the Scrapy Land Challenge #112 and see what the Design Team have made to inspire you. 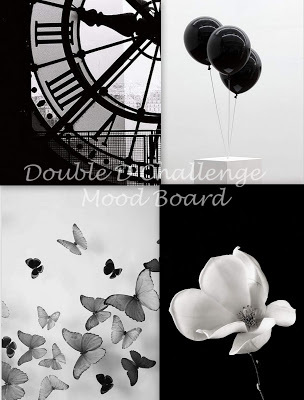 Now it is your turn to create something for this challenge. 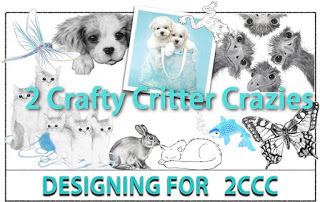 You have until April 28th to join in on the Scrapy Land Challenge fun and have a chance of winning one of two $10 gift certificates to Scrapy Land. I have a Mother's Day Card for you today! For this A2 card I started with White card stock for the base of the card. 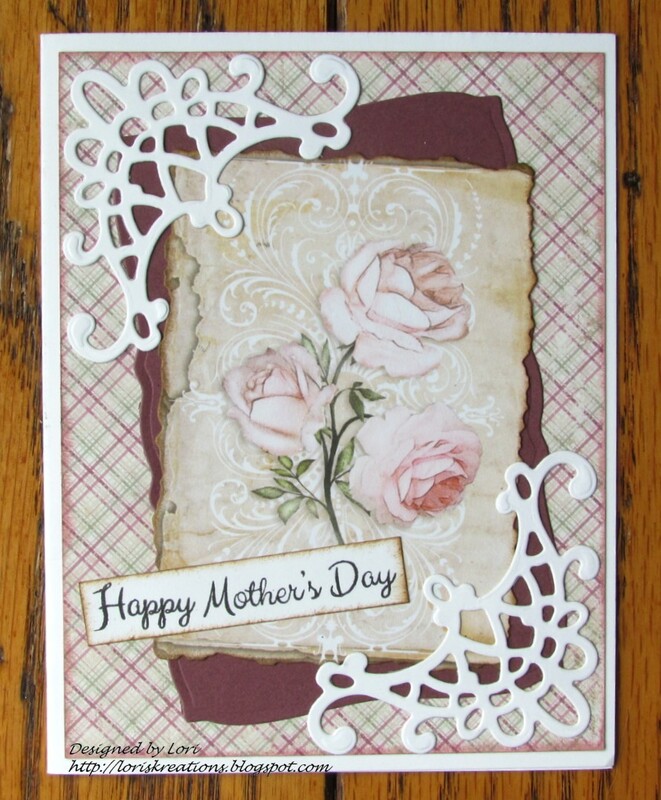 I took a piece of plaid paper, inked the edges with Victorian Velvet distress ink and added that to the card. 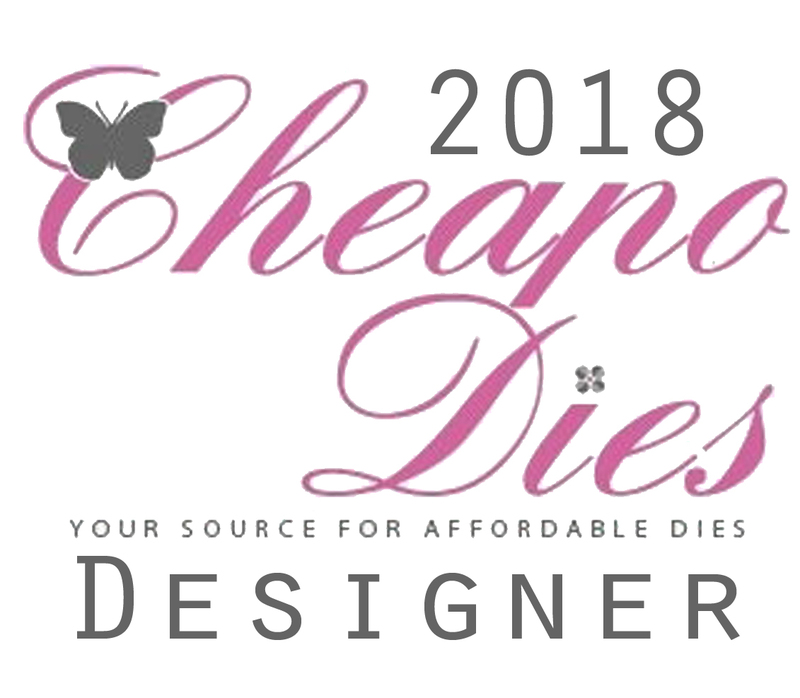 I took the Maja Designs Sofiero paper and cut out the roses, trimmed it down with distress edge scissors and inked the edges with brown ink. I took a piece of Merlot paper and cut it out with an old die, I think it is a Spellbinder, but I don't have the packaging anymore. I took the roses and layered that over the Merlot paper. I took some White paper and the Heartfelt Creations Decorative corner die and cut it out twice and used them on the corners. I took some black ink and a scrap of white paper and stamped the sentiment onto the strip and then inked the edges with brown ink and added it to the card. 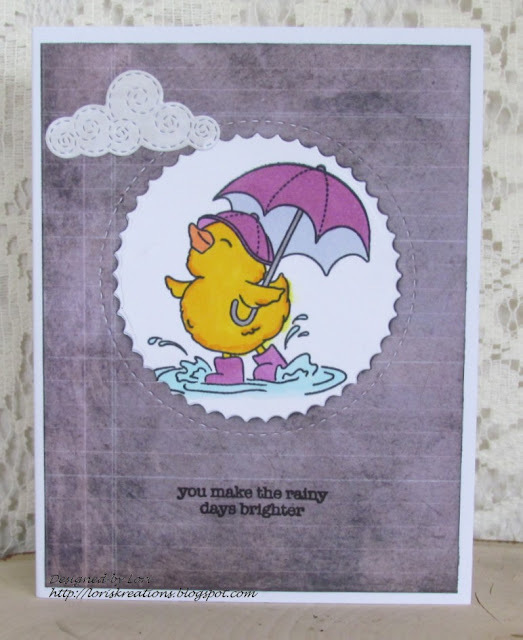 Today I have a fun April Showers card that I am sharing with you!! For this A2 card I started with white card stock for the base of the card. 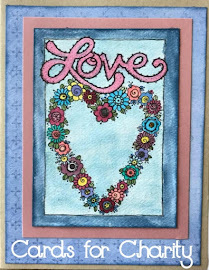 I took a piece of Grungy paper and the My Favorite Things Stitched Circle Scallop die and cut out the center circle. I inked the edges with black ink and added it to the card. 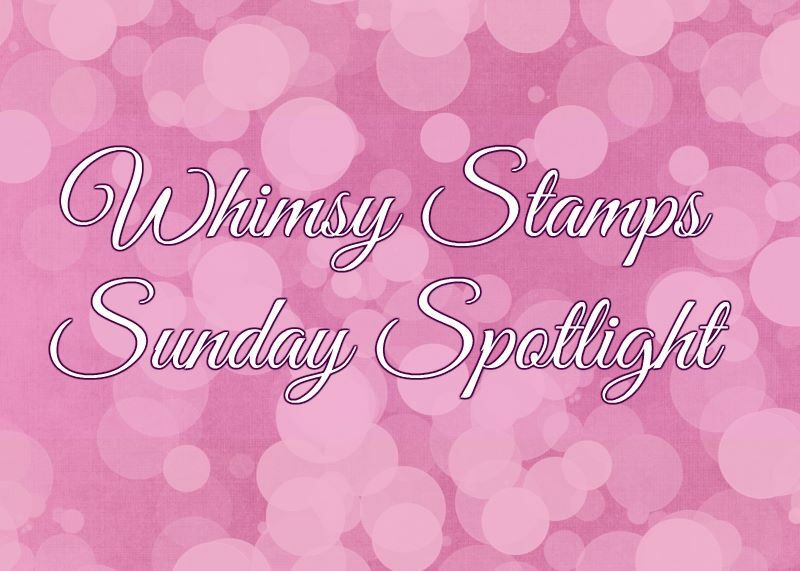 I took a piece of Neenah Solar White paper, black ink and the duck from the Simon Says Stamps Showers and Flowers stamp set and stamped him onto the paper. I colored him in with Copic markers and then used the same Stitched Circle Scallop die to cut him out and then I attached him in the center circle. I took some white paper and the Memory Box Swirl Switch Clouds die and cut out a cloud and added that to the top of the circle. 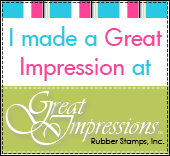 I took the sentiment from the Showers and Flowers stamp set and some black ink and stamped the sentiment under the circle. I would like to enter this card in the The Sisterhood of Crafters April Showers Challenge. 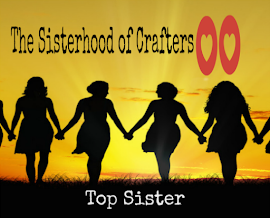 Be sure to stop by The Sisterhood of Crafters Blog to see all the lovely creations that were made for this April Showers Challenge! !